ASUNCION, Paraguay – “Stir things up, but then help organize what you have stirred up,” Pope Francis told about 220,000 young people gathered on this city’s waterfront on July 12. In his last major event before ending a weeklong trip to Ecuador, Bolivia and Paraguay, the pope spoke about service, solidarity, hope and freedom of heart. Abandoning his prepared text, he based his remarks on the testimonials of two young people who asked him questions. 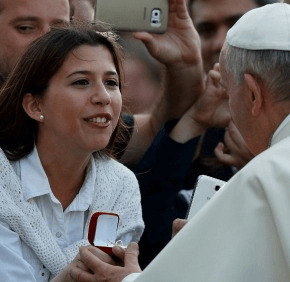 Liz Fretes, 25, told the pope how she put her life on hold to care for her mother, who had dementia, and her sick grandmother. Strained by studying in the evening and caring for her family by day, she found support among young people in her parish youth ministry. Highlighting Fretes’ care for her mother and grandmother, Pope Francis emphasized two themes that he raised often during his trip, service and solidarity. When Manuel de los Santos Aguilar was a child, his parents turned him over to a family in the city — a practice not uncommon among rural families who hoped their children would get an education. Instead, the 18-year-old told Pope Francis, he was forced to work and fell into substance abuse. He, too, found support in parish youth ministry, “where I met God, my strength,” he said. Several times during his speech, the pope urged the young people to repeat his words. Fretes’ and de los Santos Aguilar’s stories showed that hope and strength come from knowing Jesus, the pope told the crowd. He noted, however, that a priest had complained that when they stir things up, young people often make a mess that others have to fix.